Nearly 2,000 families have been evacuated from their homes and thousands of hectares of crops flooded in the wake of continuing rains and the opening of dams in Vietnam and Thailand. At least two people have died since Friday in the flooding, which has affected at least six provinces. In Stung Treng province, 1,597 families have been evacuated to higher land, Duon Pov, director of the provincial administration hall, said yesterday. Separately, at least 3,400 hectares of rice and several hundred hectares of other crops have been flooded in four districts, Touch Thea, director of the Stung Treng provincial agriculture department, said. “The agro-industrial crops such as cassava may be destroyed, because they have been flooded for a few days. Whereas it is not yet known if the rice has been destroyed [or just damaged],” he said. In Thailand, the opening of dams led to heavy flooding in three villages in O’Beichoan commune in Banteay Meanchey’s O’Chrou district, said district administrative police chief Chhun Sorngly. More than 300 families have been moved to safer areas since Friday, he said. “Water got stuck in Thailand, and they opened the floodgates, which caused serious flooding on Friday and Saturday. People had to be evacuated and their hoofed animals had to be tied along the roads,” he said. Authorities used three high-speed boats to evacuate people, he said, adding that no one had drowned as of yesterday. Officials were now preparing for the expected opening of another flood gate in the coming days. In Ratanakkiri, 73 families from Lumphat district were moved to four safe zones, said Deputy Provincial Governor Nab Bunheng. “Last week, the Vietnamese authorities informed us to take precautions, because they opened a water gate,” he said. O’Yadav District Governor Dork Sar said he already spoke with villagers about safety during the floods. On Sunday, a 25-year-old ethnic Jarai villager drowned while walking through a canal. An estimated 1,000 families have been affected by the floods, but none have been evacuated in his district yet, Sar said. More than 3,000 metres of roads were flooded in Oddar Meanchey and most of them are now impassable, officials said. But while 570 homes have been flooded, no evacuations have yet occurred. 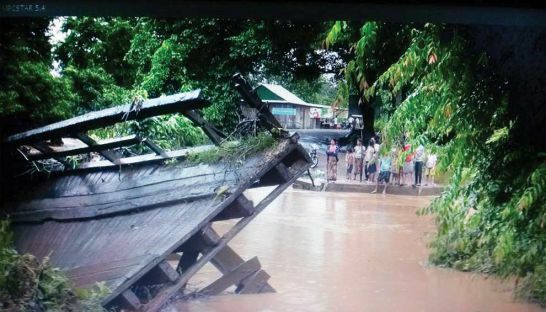 “It is a flood due to rains on Friday and Saturday, not a flood from Thailand,” clarified Thon Nol, Samroang governor, adding that waters have begun to recede. A 51-year-old was killed by electrical shock when walking through floodwaters in his home, Nol said. In Kratie province, Chet Borey and Kratie town saw more than 1,000 people and thousands of cattle evacuated to higher ground, district police official Sao Kim Hort said.